Home» AP LATEST UPDATES | EDUCATIONAL PORTAL » AP Edcet 2016 Common Entrance Test Notification Scheduled/Online Application. 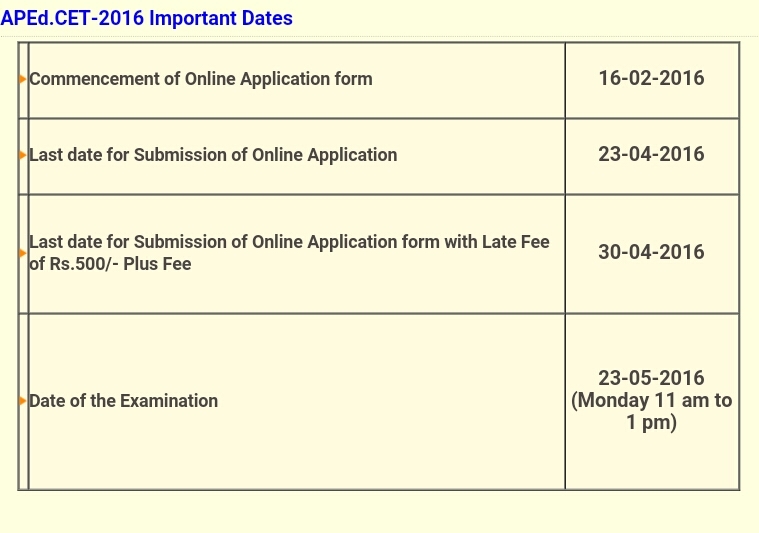 AP Edcet 2016 Common Entrance Test Notification Scheduled/Online Application. (SE.Trg-1) Dept, dt. 05-07-2004 & amendments for admission into B.Ed. regular course two years duration in the University /Un-aided/Private Colleges of Education in Andhra Pradesh for the academic year 2016-17. Eligible candidates may submit their applications through online mode only, by paying the application registration and processing fee of Rs.400/- (for SC/ST Rs.200/-) through AP Online Payment gateway (Credit Card/Debit card and Net banking). The detailed information regarding eligibility, syllabus and model Question Paper, City test centers, related instructions and procedure for Online Submission of Applications are available on the websites www.apedcet.org and www.apsche.org. Submission of Applications is permitted through online mode only. Registration Fee is non-Re fundable. Upload of Complaints from the Candidates are allowed during 25 th to 27th April 2016. Get Download Edcet 2016 Notification Click Here. Get Download Important Instructions to the Candidates Click Here.